Arcanum’s Camille Pohl knocks one of her two hits on the day in win over Coldwater. Elle Fout pitches middle relief for the Lady Trojans in win over Coldwater. Gracie Garno makes a play from shortstop in win over Lady Cavaliers. Kaylee Wilcox enjoys a moment from her catching position in Arcanum’s win over Coldwater. Mady Skelton opens on the mound for the Lady Trojans in win over Coldwater. Peyton Garbig lines a walk-off single to give the Arcanum Lady Trojans a 4-3 non-conference 10-inning win over Coldwater. Arcanum’s Sydney Artz applies a tag at second for an out in win over the Coldwater Lady Cavaliers. 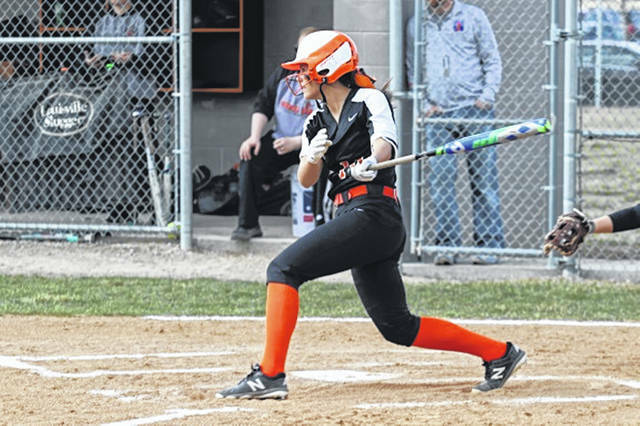 ARCANUM – The Arcanum Lady Trojans used a triple play to springboard to a tenth inning Friday night walk-off win over the visiting Coldwater Lady Cavaliers by a 4-3 score. Arcanum plated three first inning runs to lead 3-0 after one and would not dent the plate again until the bottom of the tenth to earn a 1-run non-conference extra inning game. Three consecutive singles off the bats of Sydney Artz, Peyton Garbig and Gracie Garno had the bases loaded with no outs setting up a passed ball to score Artz with the game’s first run followed by a Kaylee Wilcox sacrifice fly scoring Garbig with the game’s second run. The Lady Trojans used a Macey Hartman infield single to score Garno and give the home team a 3-0 advantage. The Lady Cavaliers, a member of the Midwest Athletic Conference (MAC) made it a 3-1 game with their first of two home runs of the night in the top of the third and added a 2-run homer in the top of the fifth to knot the game at 3-3. Arcanum struggled at the plate after the opening inning going down in order in the third, fifth, sixth, seventh and eighth while going scoreless in eight consecutive innings bringing the game to the tenth tied at 3-3. Coldwater opened the top of the tenth win a single and a hit batsman to put runners on first and second setting up a rare perfectly executed triple play – a scorching liner to Hartman at third with Hartman throwing a bullet across the diamond to Camille Pohl at first who turned and ripped a perfect throw to Arcanum shortstop Gracie Garno covering second to get the Lady Trojans out of the inning and coming to the plate. 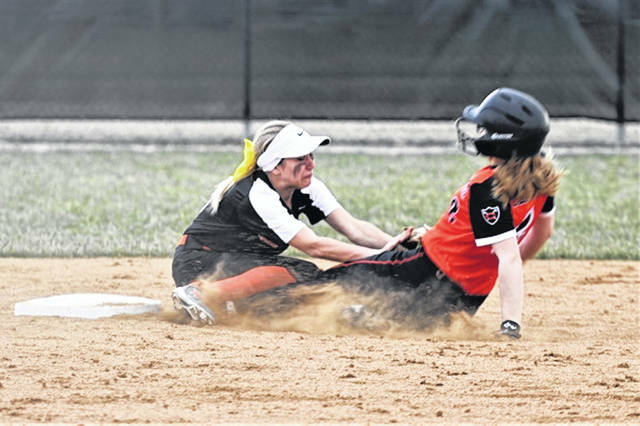 With the triple play bringing new life to the Lady Trojans bench, the Arcanum girls took advantage at the plate in the bottom of the inning. Sam Hartzell ripped a 1-out double to deep center in the Lady Trojans half of the tenth with Coach Stone bringing Megan McCans in to pinch run for Hartzell. Artz followed with a walk putting runners on first and second with one out setting up a dramatic Garbig run scoring walk off single to left and keep the Lady Trojans perfect on the season. Coldwater had 14-hits on the day while playing error free ball. Arcanum accounted for 9-hits and 1-error. Garbig went 2-5 with a RBI and a run scored. Artz was 2-4 with a walk and a run. Camille Pole went 2-4, Macey Hartman was 1-4 with a RBI, Garno was 1-4 with a run, Hartzell went 1-4 and Wilcox had a RBI. Macy Skelton pitched four innings allowing 8-hits, 3- strikeouts, 1-run and no walks. Elle Fout tossed two innings giving up 2-hits, 2-runs and striking out 2-batters. Garbig picked up the win in relief pitching the final four innings giving up 4-hits, striking out 4-Cavaliers while not allowing a run. 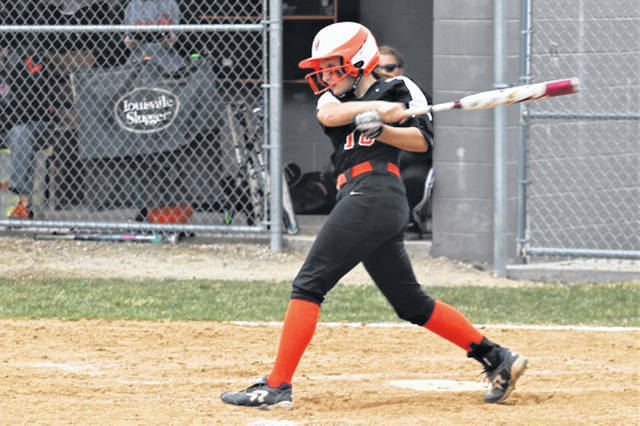 https://www.dailyadvocate.com/wp-content/uploads/sites/34/2019/04/web1_Camille-Pohl.jpgArcanum’s Camille Pohl knocks one of her two hits on the day in win over Coldwater. 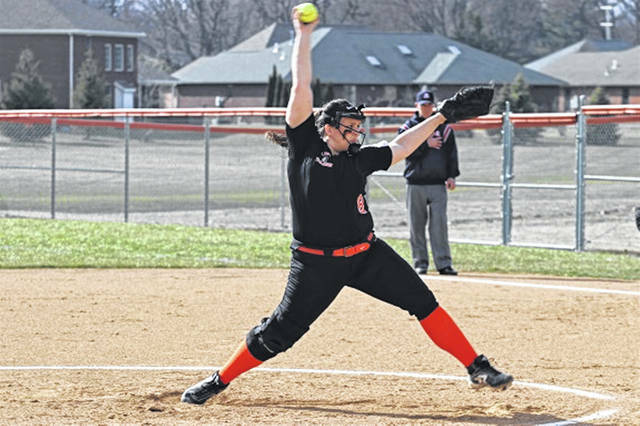 https://www.dailyadvocate.com/wp-content/uploads/sites/34/2019/04/web1_Elle-Fout.jpgElle Fout pitches middle relief for the Lady Trojans in win over Coldwater. https://www.dailyadvocate.com/wp-content/uploads/sites/34/2019/04/web1_Gracie-Garno.jpgGracie Garno makes a play from shortstop in win over Lady Cavaliers. 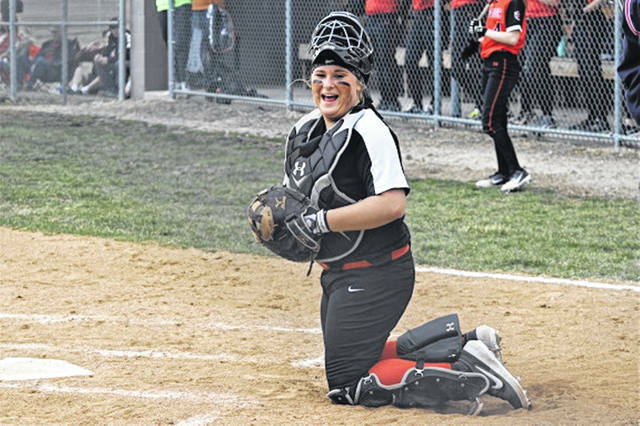 https://www.dailyadvocate.com/wp-content/uploads/sites/34/2019/04/web1_Kaylee-Wilcox.jpgKaylee Wilcox enjoys a moment from her catching position in Arcanum’s win over Coldwater. 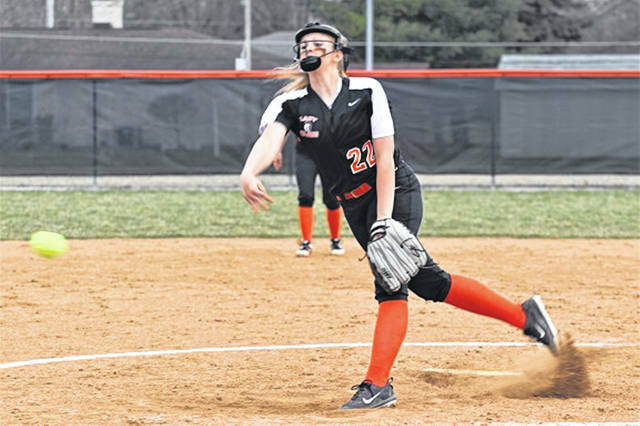 https://www.dailyadvocate.com/wp-content/uploads/sites/34/2019/04/web1_Mady-Skelton.jpgMady Skelton opens on the mound for the Lady Trojans in win over Coldwater. 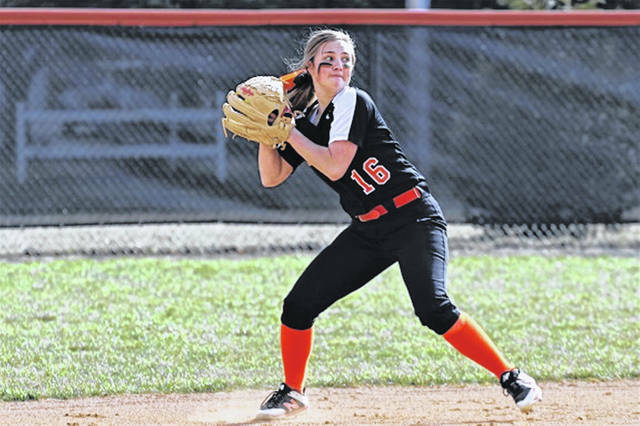 https://www.dailyadvocate.com/wp-content/uploads/sites/34/2019/04/web1_Peyton-Garbig.jpgPeyton Garbig lines a walk-off single to give the Arcanum Lady Trojans a 4-3 non-conference 10-inning win over Coldwater. https://www.dailyadvocate.com/wp-content/uploads/sites/34/2019/04/web1_Sydney-Artz.jpgArcanum’s Sydney Artz applies a tag at second for an out in win over the Coldwater Lady Cavaliers.